In the past quarter century, roundabouts—circular intersections that can improve safety and mobility—have become as American as hot dogs and baseball. Since 1990, when the first roundabout was built in the United States, between 3,500 and 4,000 of the innovative intersections have been constructed. By 2010, all 50 states and Washington, D.C., had a roundabout. Since 2014, when the Federal Highway Administration ended its promotion of roundabouts in round two of the Every Day Counts initiative, another 400-plus have been built. In a roundabout, traffic travels counterclockwise around a central island and entering traffic must yield to circulating traffic. Roundabouts eliminate perpendicular crossings and opposing direction turns in favor of low-speed merging and diverging maneuvers. Mini-roundabouts are essentially roundabouts that feature central and splitter islands that are fully traversable to accommodate large vehicles within constrained right-of-way. Roundabouts have grown in popularity in large part because they create a safer intersection. Two National Cooperative Highway Research Program reports—Roundabouts in the United States and Roundabouts: An Informational Guide—point to a reduction of 35 percent and 76 percent in total and injury crashes, respectively, following conversion to a roundabout. “The use of roundabouts is a proven strategy for improving intersection safety by eliminating or altering conflict types, reducing crash severity, and causing drivers to reduce speeds as they proceed into and through intersections,” according to Roundabouts: An Informational Guide. Simply stated, if conflicts occur, they are likely between slower-moving vehicles traveling in the same direction—not of the perpendicular type. Isebrands points out that roundabouts are an efficient design. All traffic movements—left turn, through and right turn—have equal priority. Most roundabouts require little stopping during off-peak hours. They provide traffic with a flexibility of movement that may not have existed before. Wisconsin has nearly 200 roundabouts on its state highway system. In 2011, the Wisconsin Department of Transportation did a before-and-after study on a sample of roundabouts that showed a 52 percent drop in fatal and injury crashes. 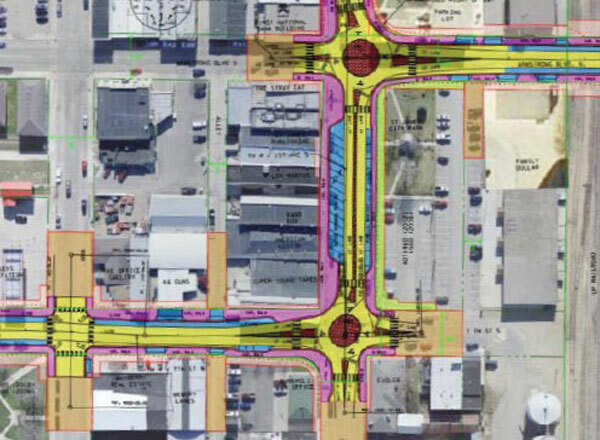 Mini-roundabouts in St. James, Minnesota, are part of an urban reconstruction project. Credit: Minnesota Department of Transportation. In one of the state’s largest highway construction projects ever, the Wisconsin DOT is improving a total of 31 miles of U.S. 41 in Winnebago and Brown Counties. In addition to extensive widening and interchange work, the department is adding 40 roundabouts, 24 in Brown County and 16 in Winnebago County. Work began in 2009 and will be completed in 2017. The Wisconsin DOT aims to reduce fatal crashes by 90 percent, crashes with injuries by 76 percent and pedestrian crashes by 30 to 40 percent. At least 15 mini-roundabouts, which offer the safety benefits of regular roundabouts in a smaller footprint, are in operation in the United States, and dozens more are planned. Among the states with mini-roundabouts are Colorado, Georgia, Maryland, New York, Texas and Washington. The Minnesota Department of Transportation and city of St. James are using an Accelerated Innovation Deployment Demonstration award to build two mini-roundabouts—the first on the state’s highway system and the first in a constrained urban setting. The mini-roundabouts are part of the Highway 4 reconstruction project and will replace two signalized intersections on 1st Avenue South. The Washington State Department of Transportation, FHWA, and local and state officials broke ground last December on a roundabout in Benton City. The project is one of many Connecting Washington projects throughout the state focused on safety, economic, environmental and mobility improvements. The roundabout, which will replace the intersection at State Routes 224 and 225, is designed to cut traffic congestion and improve access in Benton City. Video: View a video on the safety benefits of roundabouts. Video: Watch a video on how to drive on Minnesota’s mini-roundabouts. See FHWA’s Roundabouts and Mini-Roundabouts webpage for case studies, reports and technical information. See the Wisconsin DOT’s How Roundabouts Work webpage for driving tips, brochures and videos for road users. Read Roundabout Practices for a summary of roundabout policies, guidance and procedures at state transportation departments. Contact Hillary Isebrands of FHWA’s Resource Center for more information. As part of its push to streamline project coordination, the Texas Department of Transportation sends construction and maintenance agreements to railroads electronically rather than on paper. This enables railroads to load documents into their agreement management systems more easily and get internal approvals faster. As a result, agreement processing time dropped from more than 16 weeks to as little as four to six weeks. Texas is one of nine states that have institutionalized the use of tools and practices to improve department of transportation and railroad coordination, a strategy the Federal Highway Administration is promoting in the third round of Every Day Counts. Another six states and Washington, D.C., are piloting the innovation or preparing for full deployment. The EDC-3 effort uses a model agreement library, tools and training developed under the second Strategic Highway Research Program R16 project, which enables agencies and railroads to identify sources of conflict and develop memorandums of understanding for projects and programs. “When you consider the hundreds of highway projects that cross or abut railroad rights-of-way each year, you get an idea of the magnitude of extended coordination needed between these organizations,” said Joseph Taylor of the FHWA Office of Infrastructure, who leads the EDC-3 Improving DOT and Railroad Coordination Innovation Deployment Team. Enhancing collaboration and streamlining processes can save money and time for highway agencies and railroads and result in faster, smarter highway renewal, Taylor said. Alabama Department of Transportation staff meet with county engineers, railroad representatives and FHWA staff to coordinate on railroad-related issues, such as the railroad agreement and invoicing process. The Alabama DOT collaborated with railroads to write new railroad crossing guidance for developing Federal-Aid Highway Program projects that involve railroad property. Enhancing collaboration between highway agencies and railroads can expedite transportation project delivery. The Delaware Department of Transportation is using SHRP2 funds to develop master agreements with the seven railroad companies it works with to streamline the construction project process. The agency signed a maintenance agreement with Norfolk Southern Railway for railroad crossings in the pavement rehabilitation program. The Idaho Transportation Department collaborated with the primary railroad companies operating in the state on a master agreement project. The department and BNSF Railway agreed to keep their existing agreement. The department approved and Union Pacific Railroad is reviewing a draft master agreement for the two organizations. Secondary railroads plan to follow the agreement between the department and Union Pacific Railroad. The Iowa Department of Transportation developed an online railroad safety awareness course that inspection staff on railroad-related projects now use. The agency produced standard specifications for work on or near Union Pacific Railroad, Canadian Northern Railway and Canadian Pacific Railway property and is developing specifications for short-line railroads in the state. The Tennessee Department of Transportation has master agreements with CSX, Illinois Central Railway and Norfolk Southern Railway. 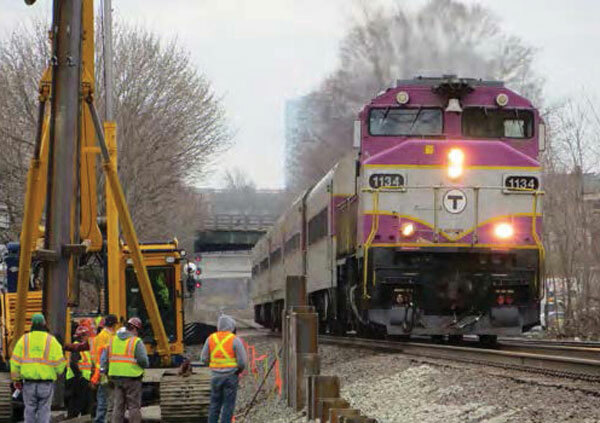 Benefits of coordination include early identification of issues railroads may have with project plans and time savings on project development processes. For example, the Tennessee DOT worked with Norfolk Southern to streamline the process for resurfacing projects, which reduced railroad approval time. Watch Railroad-DOT Mitigation Strategies, a webinar on the SHRP2 R16 project and tools available to help agencies and railroads work together on projects. Read Strategies for Improving the Project Agreement Process Between Highway Agencies and Railroads for recommended practices, streamlined permitting processes and model agreements. Contact Joseph Taylor of the FHWA Office of Infrastructure for information and technical assistance. With the addition of the Hawaii State Transportation Innovation Council, the national STIC network now includes all 50 states, Puerto Rico, the U.S. Virgin Islands, Washington, D.C., and Federal Lands Highway. Since launching the Every Day Counts initiative in 2009, the Federal Highway Administration has encouraged the formation of STICs in each state to enable government agencies and the private sector to work together on innovation deployment. The councils meet regularly to evaluate innovations from a variety of sources, decide which to adopt, develop implementation plans and set the pace for implementation. STIC members include the Hawaii Department of Transportation, FHWA, local agencies, University of Hawaii, American Council of Engineering Companies of Hawaii, General Contractors Association of Hawaii, Cement and Concrete Products Industry of Hawaii, Hawaii Asphalt Pavement Industry and Local Technical Assistance Program. 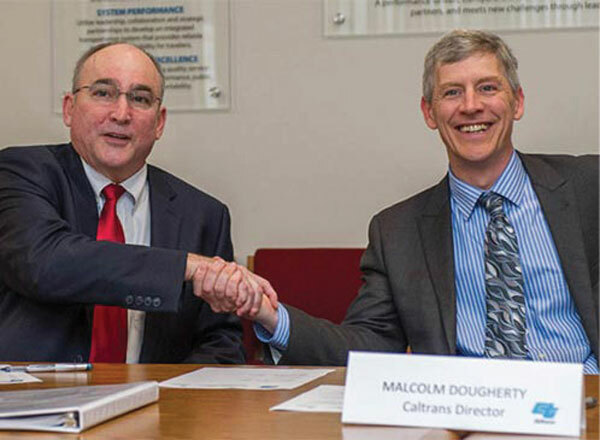 FHWA Administrator Gregory Nadeau (left) was on hand when California Department of Transportation Director Malcolm Dougherty signed the state’s STIC charter. The Texas STIC’s mission is to facilitate innovation implementation “to ensure smart, efficient investment in Texas highway and transportation infrastructure,” according to the charter. FHWA offers resources through its STIC Incentive program to help STICs mainstream innovations. The program provides up to $100,000 per STIC per year to support the costs of standardizing innovative practices in a state transportation department or other public sector STIC stakeholder. STIC Incentive projects funded in 2016 include an Idaho workshop to advance 3D modeling and automated machine guidance and a series of Ohio events for local agencies on e-Construction, road diets and data-driven safety analysis. Awards also will be used to procure an automated cylinder end grinder to test ultra-high performance concrete in Delaware and develop a mapping framework for data integration in Vermont. 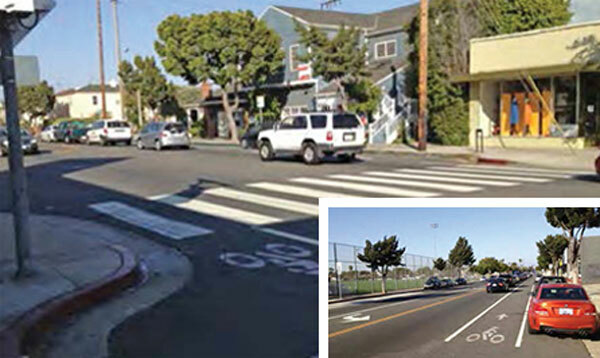 Santa Monica, California, installed a temporary road diet on a stretch of Ocean Park Boulevard with two schools after other safety measures had insufficient influence on a surge in crashes and speeding. The city of Santa Monica converted part of four-lane Ocean Park Boulevard to one travel lane and bicycle lane in each direction with a two-way left-turn lane in the middle. The city converted the four-lane road to one travel lane and bicycle lane in each direction with a two-way left-turn lane in the middle. As a result, collisions dropped 65 percent and motorists drove 10 miles per hour slower inside the road diet limits, prompting the city to make the roadway reconfiguration permanent as part of a resurfacing project on Ocean Park. Safety—Studies show a 19 to 47 percent decline in crashes when a road diet is installed on a four-lane undivided road. They also make room for pedestrian refuge islands in the midblock crossing area, where 70 percent of pedestrian fatalities occur. Low cost—The majority of road diets are installed on existing pavement within the right-of-way, essentially for the cost of restriping pavement lanes. Quality of life—Road diets can make shared spaces more livable and contribute to a community-focused environment. Today, road diets are attracting widespread interest as part of the third round of the Federal Highway Administration’s Every Day Counts initiative. They are a standard practice in 11 states and Washington, D.C. Another 32 states are installing road diets and developing processes for identifying potential sites for roadway reconfiguration. One of the cities that has institutionalized road diets is Phoenix, Arizona, which implemented a Comprehensive Bicycle Master Plan and complete streets ordinance. Both efforts rely on road diets to improve safety and add bike and pedestrian facilities. Road diets are part of the Indiana Department of Transportation’s Common Paths approach to roadway planning and design that balances the needs of various travel modes to ensure safe, efficient and accessible transportation for all users. The agency introduced the road diet concept during Common Paths workshops for designers, engineers, planners and decision makers. The Maine Department of Transportation routinely considers road diets to enhance safety and mobility. The agency temporarily reconfigured a section of Route 202 in Manchester using road diet concepts. The road was changed from two eastbound lanes and one westbound lane to one eastbound lane, one westbound lane and a center left-turn lane. If the trial run is successful, the reconfiguration will become permanent. Road diet projects in Maryland are adding bike lanes on Maryland Route 170 and U.S. 1. The Maryland State Highway Administration plans to select additional road diet projects using criteria such as annual average daily traffic of more than 20,000 vehicles, road width of 48 or more feet, and proximity to transit facilities and bicycle destination points. The New Jersey Department of Transportation promotes road diets to address high pedestrian crash rates. The agency is developing a checklist for analyzing highway sections to determine road diet feasibility. In addition to installing road diets on state roads, the New Jersey DOT works with metropolitan planning organizations to identify projects on local and county roads. The Virginia Department of Transportation’s Reston road diets project won a National Roadway Safety Award from the Roadway Safety Foundation and FHWA. The road diets were designed to make travel safer by reducing the number of lanes on segments of Lawyers Road and Soapstone Drive that each carry 10,000 vehicles a day and were prone to speeding. After project completion, crashes dropped 69 percent on Lawyers Road and 67 percent on Soapstone Drive. Read Road Diet Case Studies for more examples and advice on implementing road diets. Watch the EDC Exchange: Road Diets webcast for a discussion of road diet applications and success stories. Go to the Ohio Local Technical Assistance Program’s eLearning website for a free course on road diets, including why they’re an effective safety strategy and how to analyze their impact. Read Road Diet Informational Guide for details on the decision-making process to determine if road diets are a good fit for a corridor. See the FHWA Road Diets webpage for roadway reconfiguration resources, including the Michigan Department of Transportation road diet checklist and Oakland, California, complete streets/pavement project coordination checklist. Contact Becky Crowe of the FHWA Office of Safety and Keith Harrison of the FHWA Resource Center for information and technical assistance. Preliminary results from the Oklahoma Department of Transportation’s first two high-friction surface treatment projects on rural, low-traffic roads were promising. But the agency wanted to evaluate the technology on highways with high traffic volumes. 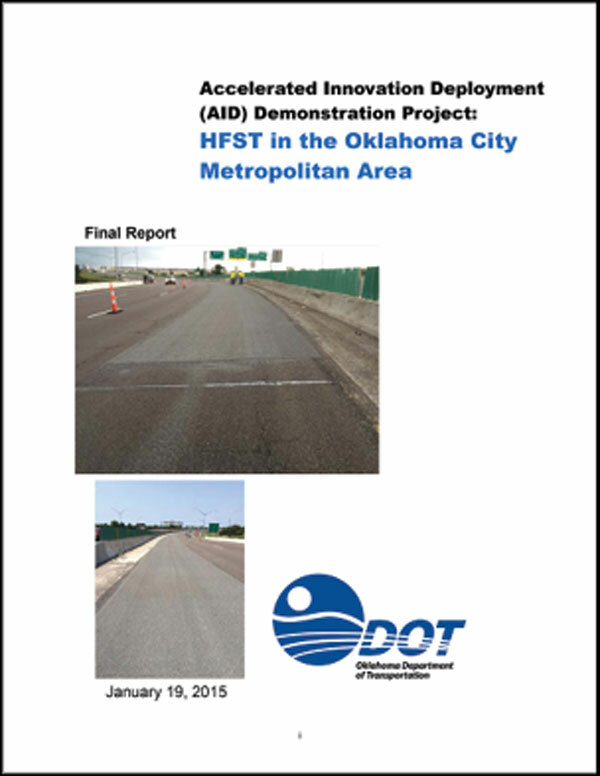 An Accelerated Innovation Deployment Demonstration award enabled the Oklahoma DOT to gain experience applying HFST—pavement overlay systems with exceptional skid resistance—on interstates. Demonstrate the installation and service life of the technology at high-traffic locations. Improve safety on the curves by providing increased pavement friction to help motorists maintain better control, reducing roadway departure crashes, injuries and fatalities. The Oklahoma DOT chose the sites for HFST application based on crash experience and pavement condition. The entire application was done using an automated process. Because of the traffic volumes at the three locations, work was done at off-peak travel times and on weekends. Only one lane at a time was closed, except when crews applied HFST to the center lanes. Wind guides should be used for automated HFST applications in the future. Although crews on the project used an automated system, they had to do some manual work when wind interfered with distribution of the HFST materials. 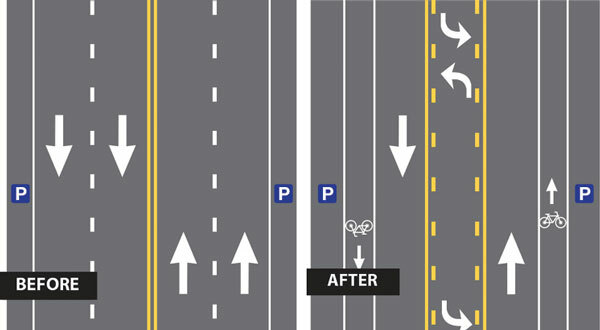 When applying HFST at high-traffic locations, lane striping should be left uncovered because temporary lane markers may not stay in place long enough. All loose aggregate should be removed from the roadway after HFST application. At one site on the project, loose aggregate remained on the shoulder after installation. It may be desirable on future projects to allow work on high-traffic roads at night only. Working on the center lanes required closing two lanes at a time on the project, which resulted in congestion even at off-peak times during the day. The Oklahoma DOT plans to collect crash, friction and skid data at the project sites for at least three years to evaluate the safety impacts of applying HFST. Initial skid numbers for the completed project were high at 80 to 84, a substantial improvement over preconstruction skid numbers ranging from 31 to 36. Friction numbers also showed significant improvement. “The Oklahoma DOT determined from the preliminary results of our data analysis that installation of HFST on multilane high-volume highways is practicable and that dramatically improved friction numbers can be achieved,” the agency said in its report. Using experience gained on the project, the Oklahoma DOT is developing HFST standards and initiating a program to apply the technology to a number of selected curves each year. The Delaware Department of Transportation started work on a project to build the state’s first diverging diamond interchange at Delaware Routes 1 and 72 in New Castle County. The agency is using the design-build delivery method on the project, which received an Accelerated Innovation Deployment Demonstration award. Using a diverging diamond interchange and design-build is expected to lower project costs while enhancing safety and mobility at the interchange. The Kansas Department of Transportation continues to make progress on the Johnson County Gateway, the state’s first major design-build project. Two new flyover ramps opened in the spring to serve traffic on eastbound I-435 to northbound I-35 and westbound I-435 to southbound I-35. The project is designed to improve safety and relieve congestion on the I-435/I-35/K-10 interchange. It’s scheduled for completion by the end of 2016. The Pueblo of Acoma is using the construction manager/general contractor method to accelerate construction on nine transportation improvement projects in Acomita Village, New Mexico, while delivering the projects under budget and enhancing quality. The projects include road stabilization, intersection safety improvements, bridge replacements, road maintenance plan development and a highway reconstruction that accommodates biking and walking paths. The Rhode Island Department of Transportation is using accelerated bridge construction techniques to replace the East Shore Expressway and McCormick Quarry bridges in East Providence. The agency will cut project construction time and traffic delays by building geosynthetic reinforced soil abutments and using self-propelled modular transporters to install new superstructures. The bridges—a vital link in Rhode Island’s highway system—are expected to be completed a year earlier than possible using conventional construction methods. A spring ceremony celebrated the grand opening of the Washington State Department of Transportation’s State Route 520 floating bridge. 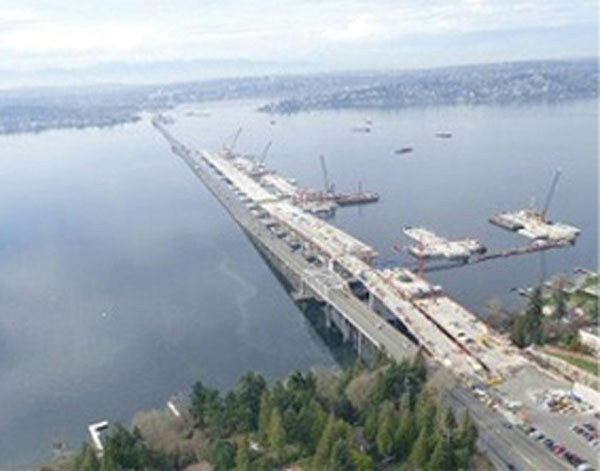 The 7,700-foot-long bridge—the world’s longest floating bridge—was built with the design-build project delivery method. The new bridge replaces one that opened in 1963 with a safer structure that offers more roadway and transit capacity. Summer showcases offered two opportunities to observe geosynthetic reinforced soil-integrated bridge system construction in person. The Indiana Local Technical Assistance Program, Hamilton County Highway Department and FHWA hosted a Hamilton County Bridge 299 project showcase in Noblesville, Indiana. FHWA and Crook County, Wyoming, planned a Sand Creek bridge replacement project showcase in Spearfish, South Dakota. Both events featured presentations on implementing the technology and project site visits.